There are a lot of misconceptions about chickens. 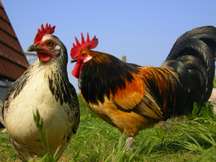 Many people have heard that chickens are noisy or smelly animals, however, chickens are generally quiet animals only squawking when they lay an egg, which is once a day. Chickens are also not smelly animals. This is not to say that their habitats cannot become stinky with neglect, just like anything else, but with proper care, they will remain happy, healthy, and odor free. Chickens also make great composters, so they can improve the quality of your lawn and garden. More information can be found on the Mad City Chickens FAQ page and on the other sites listed on our Resources page.